Frank B. Stearns organized F.B. Stearns & Company in 1898 with his brothers and they began producing automobiles out of their family’s barn in Cleveland. This 1903 Suburban model featured an 11 horsepower single-cylinder engine. Stearns sold his company to Willys in 1925 and Willys scuttled the company in 1929. 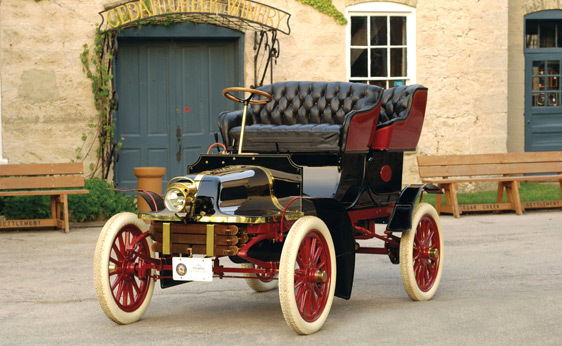 In their day, Stearns automobiles were among America’s best – on the same level as Packard. But there are far fewer Stearns’ left in existence. The car was tracked down in Michigan in the 1950s and restored in 1993. The car has not been driven much since the full restoration and still looks great. It is offered from the estate of John O’Quinn – a massive car collector who died a few years ago and RM has been parting the collection out since. RM’s pre-sale estimate is $80,000-$100,000. Learn more about the car here (including the possible Astor-family connection). RM’s Arizona sale details are available here. This entry was posted in Uncategorized and tagged 1903, auction, classic, classic cars, rear-entry tonneau, RM, rm auctions, stearns, suburban by classiccarweekly. Bookmark the permalink.